PALM: Palms are one of the most documented and most studied plants in the world and there are over 2600 species of palm tree types known today. Palm trees have an amazing amount of variations and differences in morphology, creating one the most diverse range of species. Basic characteristics of palm trees include growth from a single stem with crowns of evergreen leaves arranged in either a fan shape or feathery blooms. Most palms have inflorescence containing colorful flowers, which are usually small and white. The fruits of palms are considered to be drupes, or fruits containing a fleshy, soft part surrounding a hard seed center. Parlor Palm: One of the most popular palms in the world, its ability to put up with low light, drought and general abuse is legendary. Additionally it flowers when still quite young. Too well known to need any description, it has been in use since Victorian times and is suitable for home or conservatory. It is also known as the Table palm or Neanthe bella palm but the correct name is Chamaedorea elegans 'Bella'. Parlor Palms can adapt to just about any typical office or home interior. It is grown primarily for indoor use in 6 inch - 14 inch containers, ranging in height from 18 inches to 3-4 feet You'll find it used as a table top plant, grouped together in beds as under plantings, and as a low stand alone plant. 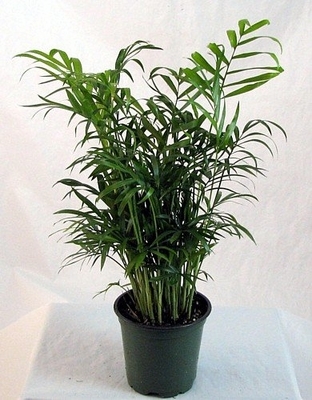 The Parlor Palm is one of the hardiest and impossible to kill houseplants!